How the Vatican views animals, and why Christians should care ... As 41,000 devout Catholics crowd the new Washington Nationals Stadium this morning for a Holy Mass led by Pope Benedict XVI, animal protection is not likely to be on their minds. Amid the great questions of war, justice, and life, animals might also appear a humble concern for the leader of the world's 1.2 billion Catholics. 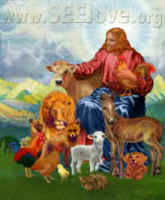 But the Pope himself has suggested that the issue of animal protection is far from irrelevant to the Catholic faith. When a German journalist put the issue to the then Cardinal Ratzinger in 2002, he received a surprising answer. The Pontiff-to-be called the issue "very serious," detailing his theological belief that animals are God's creatures, deserving of merciful treatment by man. With "creation care" a growing environmental movement in American congregations, animal protection will hopefully gain religious notice. In the meantime, Catholic priests can look to the words of Pope Benedict XV, the current Pontiff's namesake, who in 1915 enjoined priests to support the Italian SPCA, "that they may offer to the animals refuge from every suspicion of roughness, cruelty, or barbarism, and lead men to understand from the beauty of creation something of the infinite perfection of their Creator." Lewis E. Bollard '09 is a social studies concentrator in Kirkland House. His column appears on alternate Thursdays.